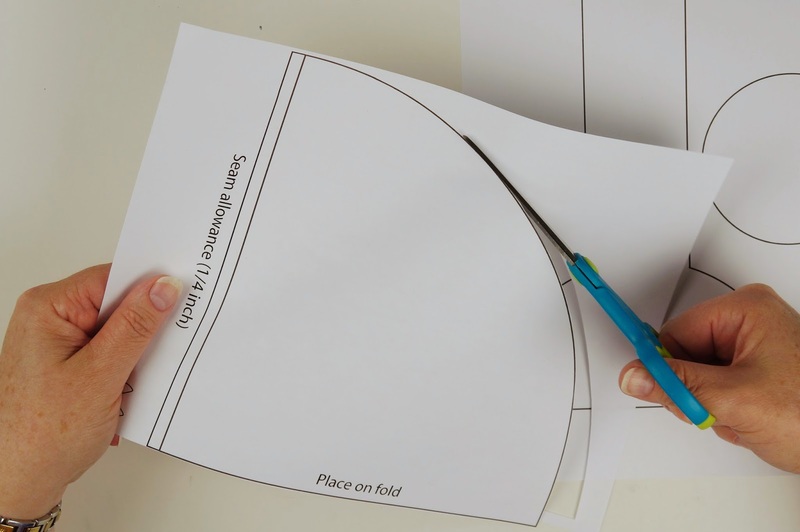 First you will need to print out the template (all 4 pages). 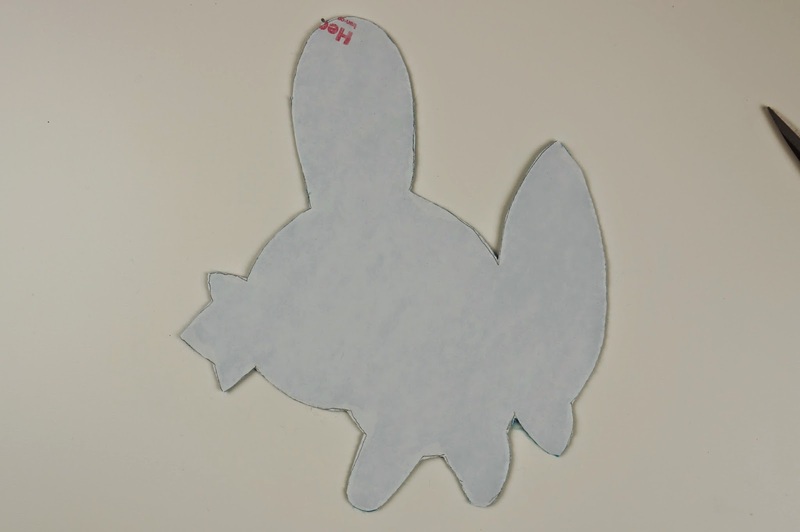 Once you have your template printed, cut out the first 2 pages (the pokeball pattern). 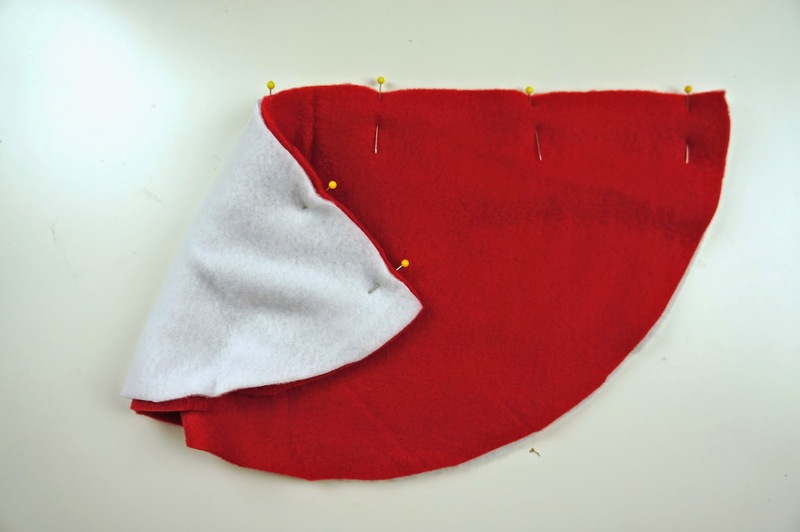 Using your red fleece, fold right sides together. 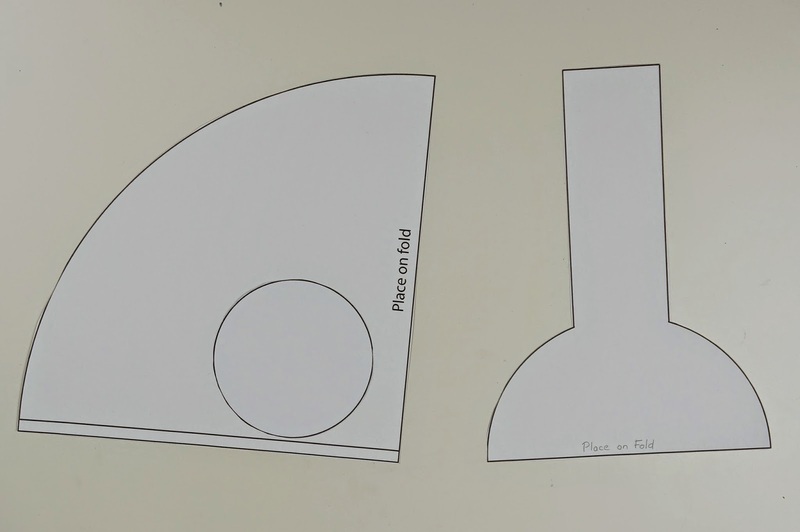 Place the quarter circle template on fold where labelled, pin and cut. 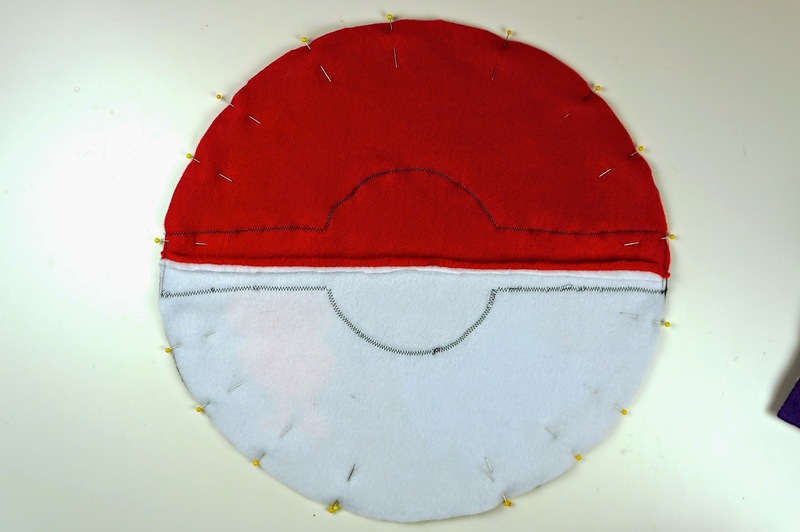 Remove the pins and template and unfold your fabric, you should have a half circle. 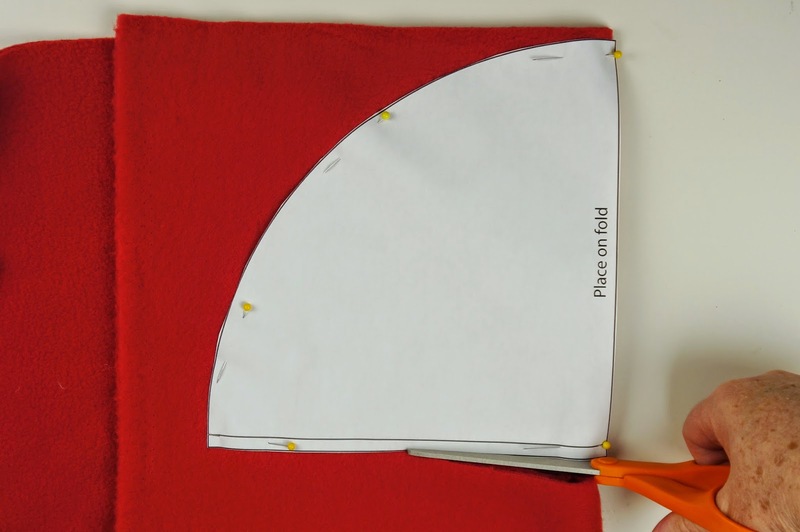 Now with your white fleece, fold with right sides together, place quarter circle template on fold, pin and cut. 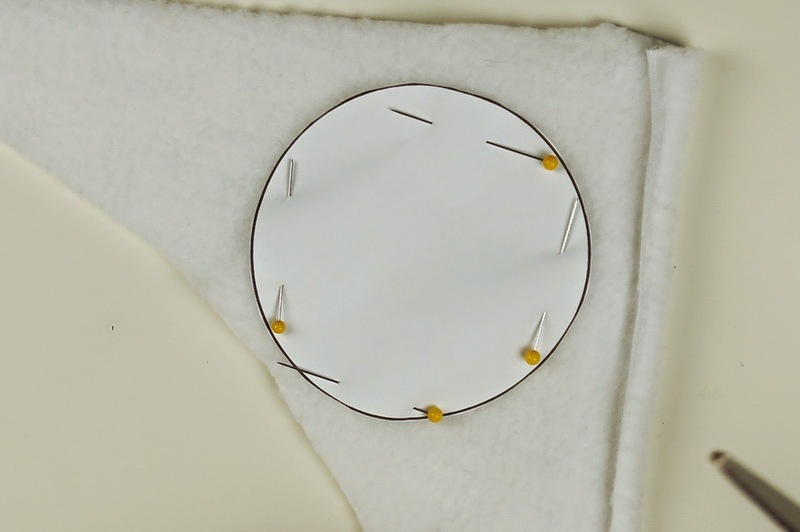 Unfold fabric to single thickness, place small circle template on right side of fleece, pin and cut. 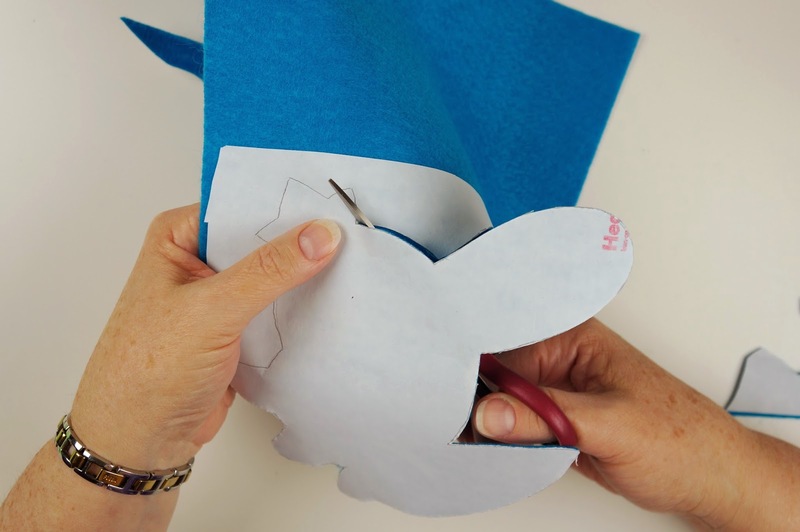 Remove your pins and template from both pieces. 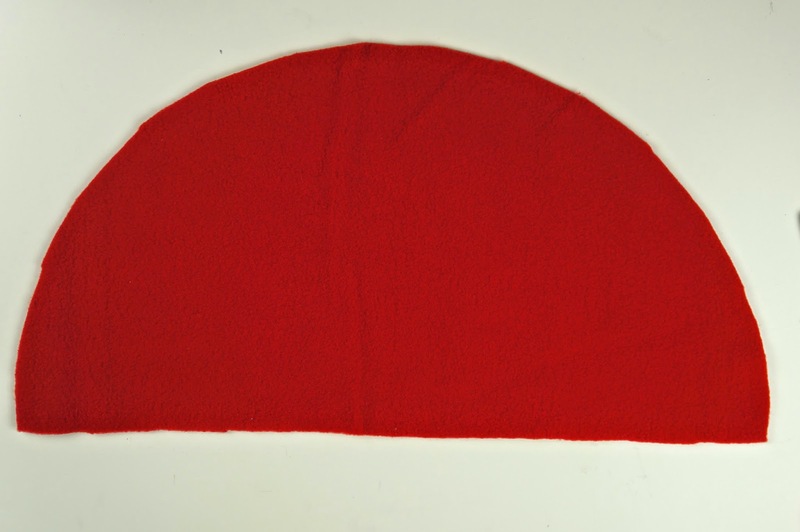 You should have a half circle and a small circle out of the white fleece. 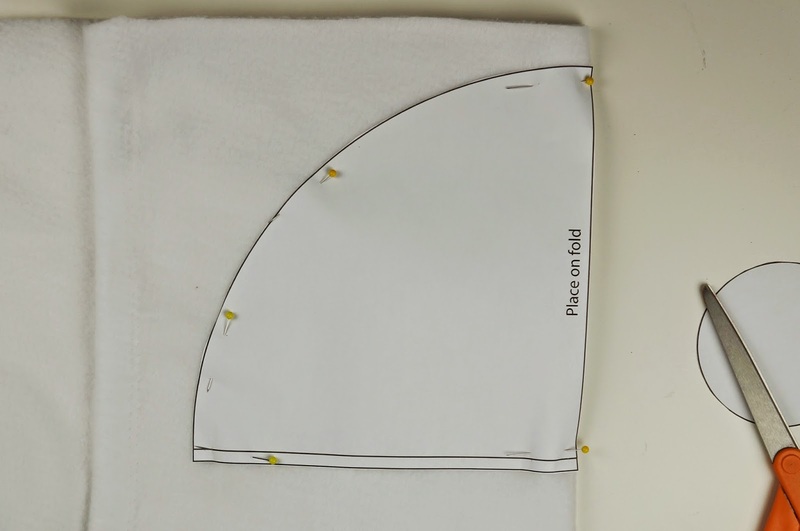 Using your black fleece, fold right sides together, place band template with half circle on fold (as labelled). Pin in place and cut. 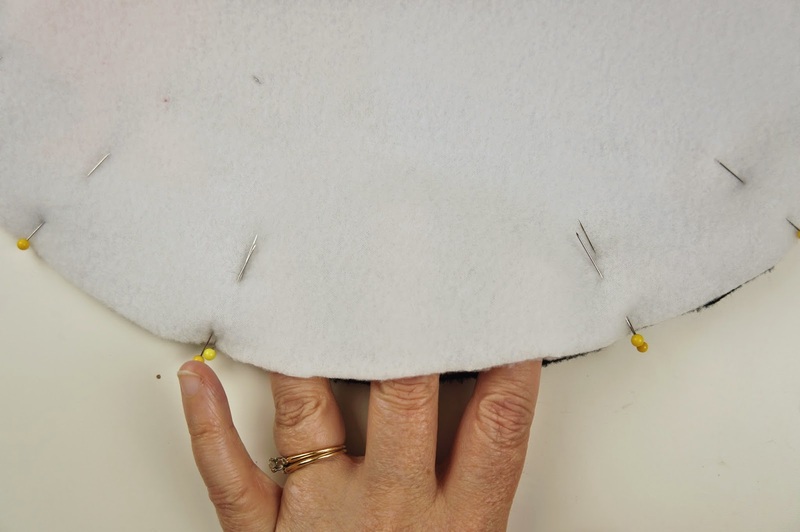 Remove pins and template. 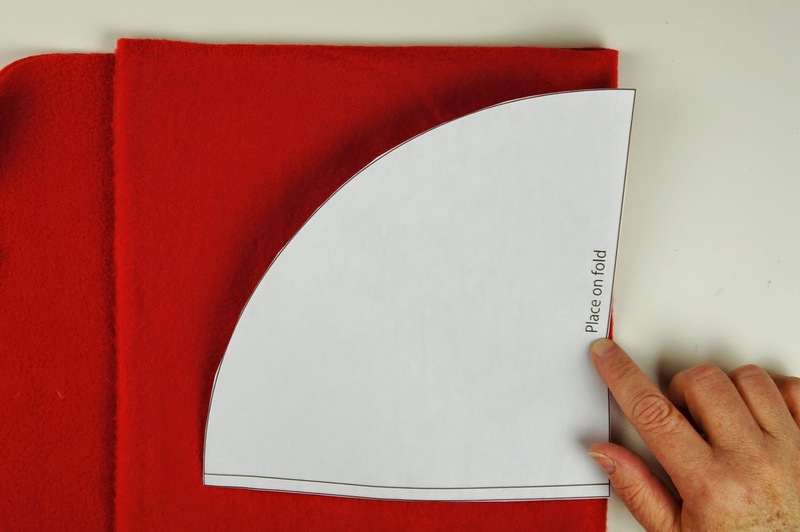 Unfold fabric giving you a full circle with band. We will be cutting the back circle of the pillow later. 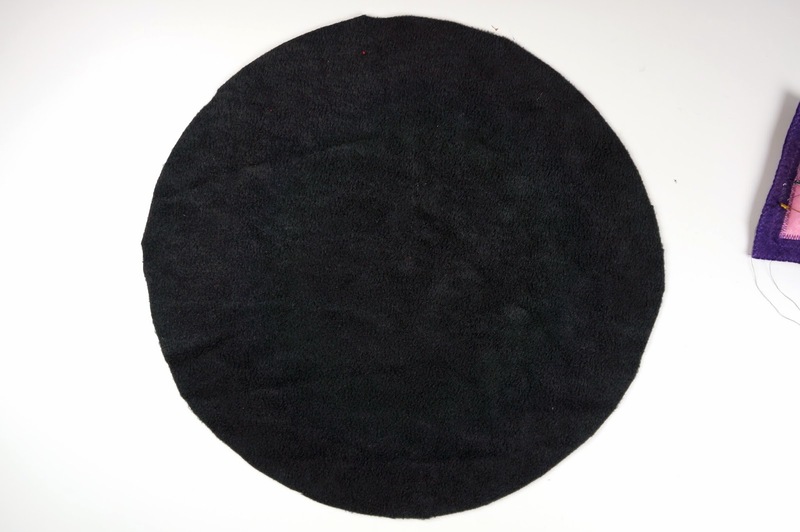 Place white circle in the center of the black circle, pin in place. 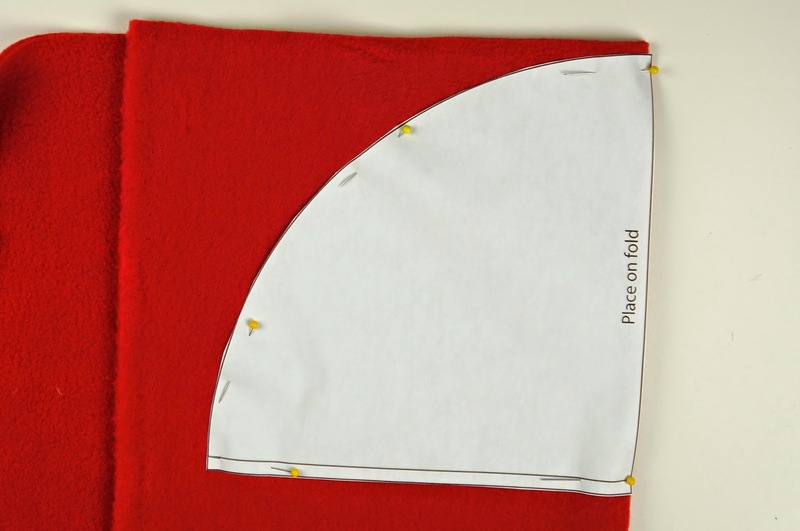 Using your sewing machine, zig zag in place. 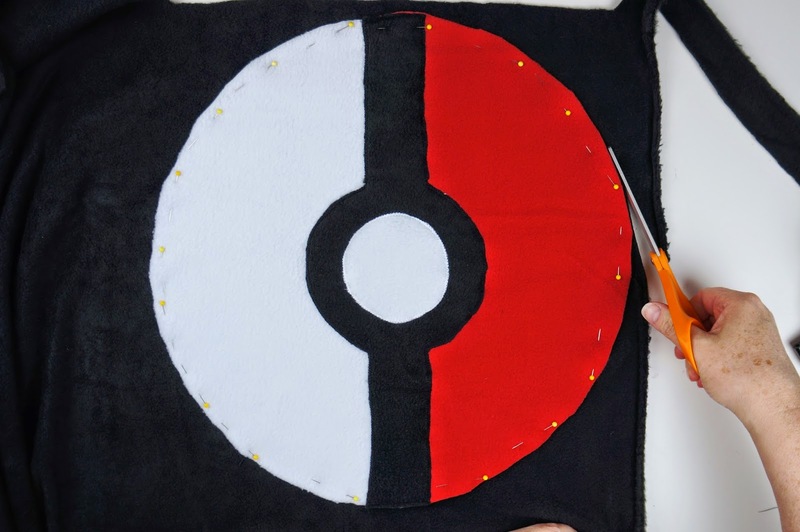 Next pin your red and white half circles right sides together. 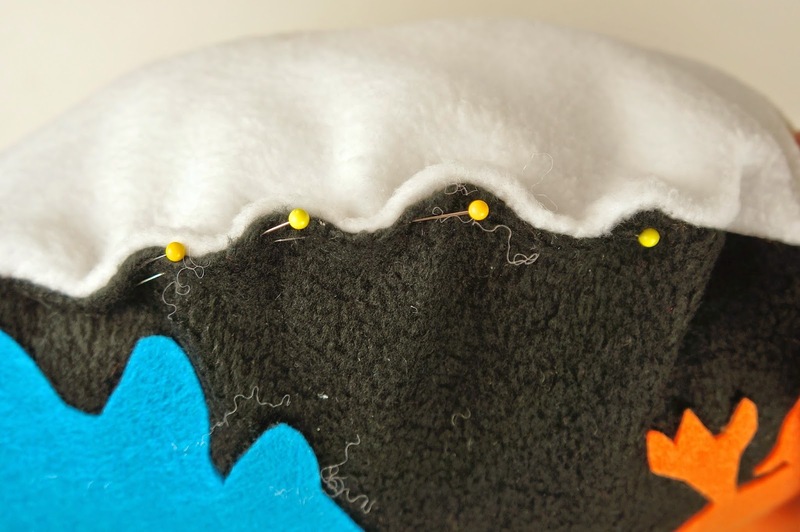 Sew pressure foot width using a regular stitch. On right side, center band over seam. 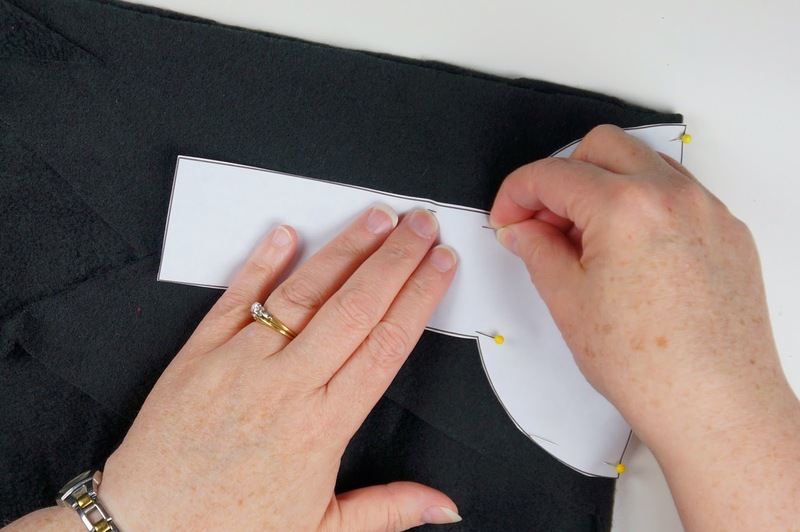 Pin in place and sew using a zig zag stitch. 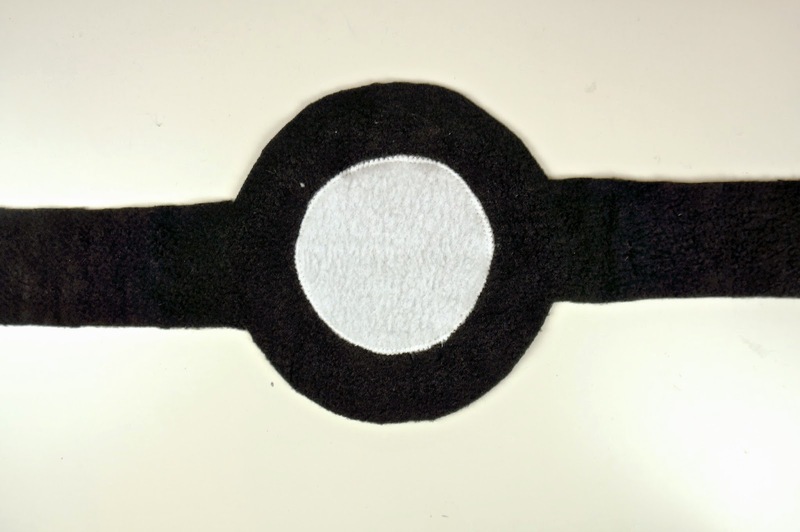 Stitch ends of band in place, trim excess black fleece. 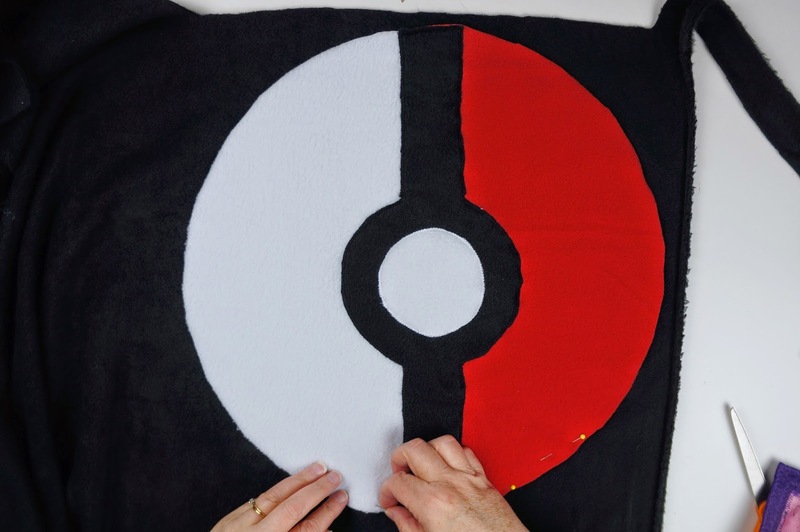 Use your pokeball front as your template to cut the back of the pillow. 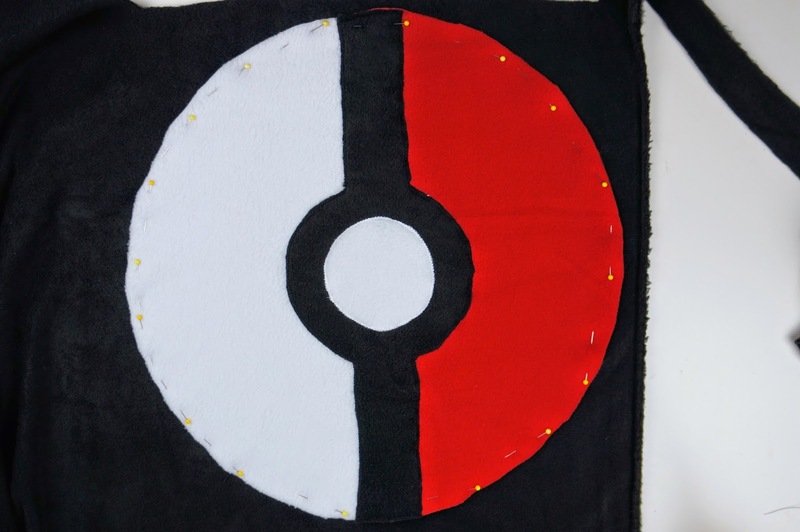 Pin pokeball onto single layer of black fleece and cut out. 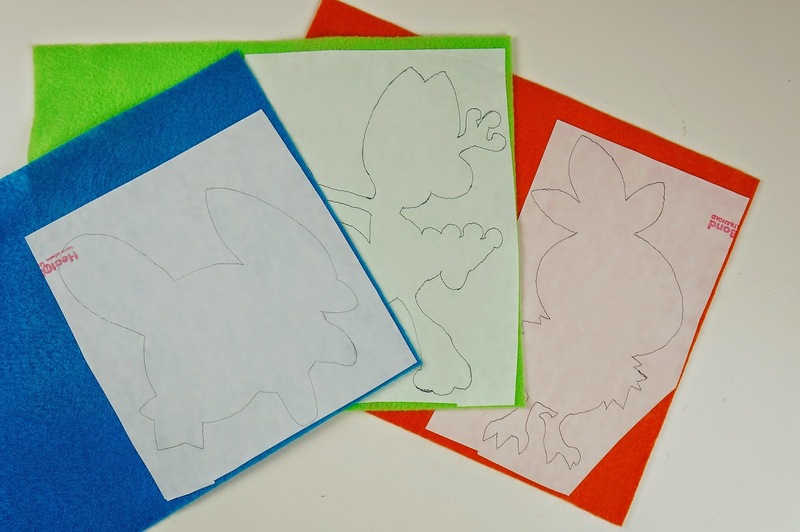 Using the other 2 pages of the template (the pokemon silhouettes), cut pieces of Heat n Bond that will cover each character. 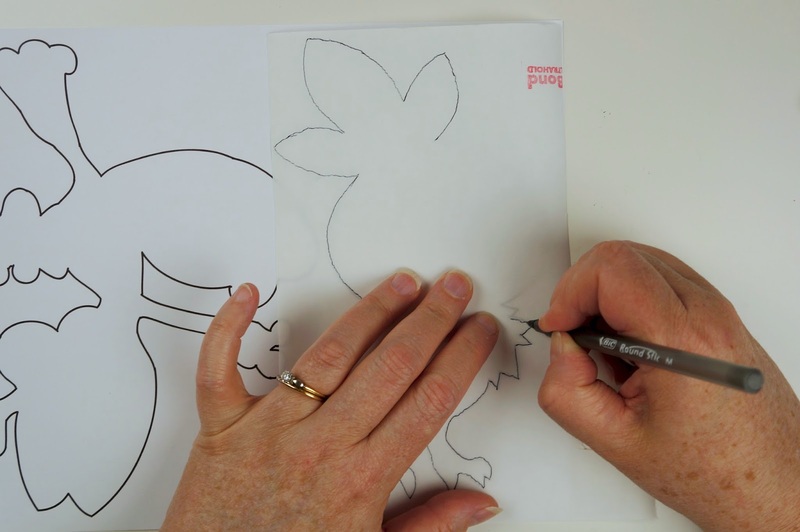 Place Heat n Bond piece paper side up over a pokemon and trace outline. Do the same for remaining pokemon. 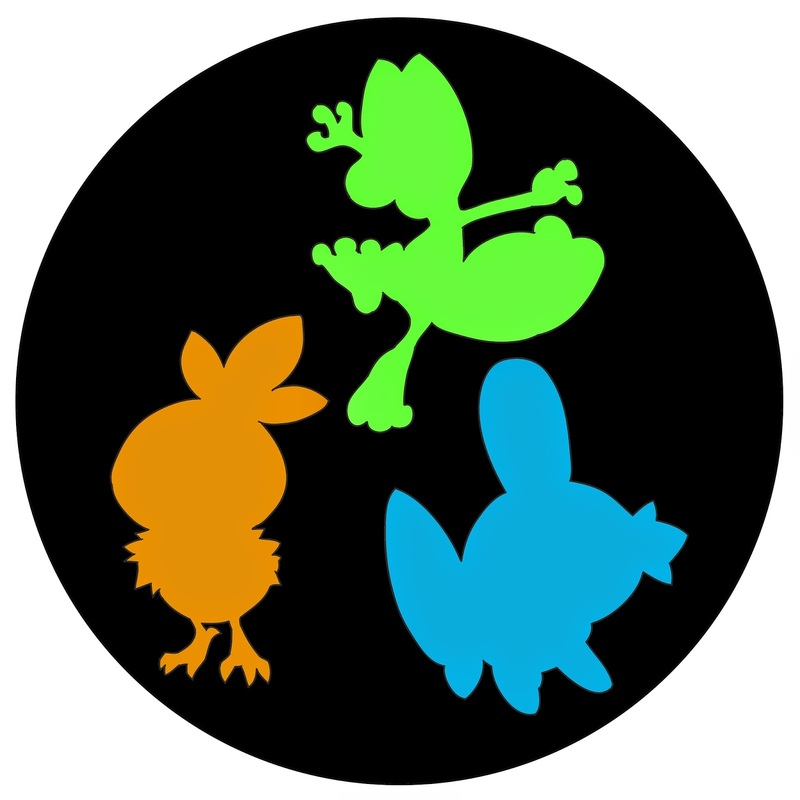 Following manufacturers directions, iron on character silhouette to each appropriate colour. 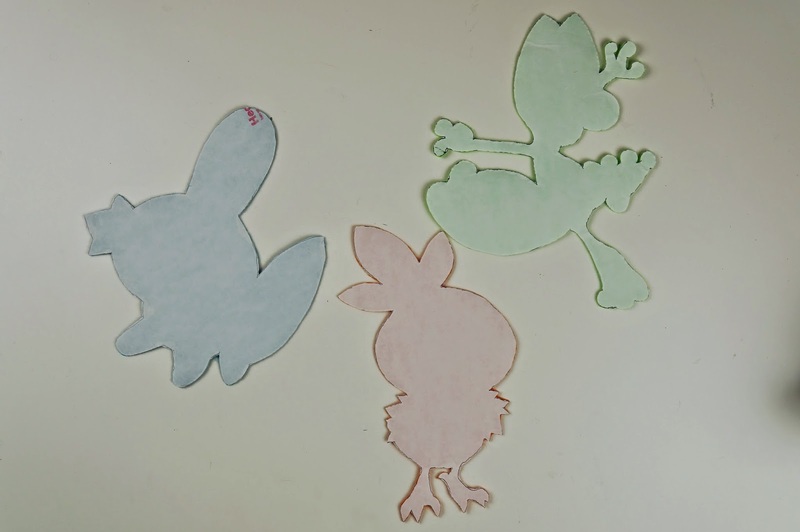 Carefully cut out each silhouette. 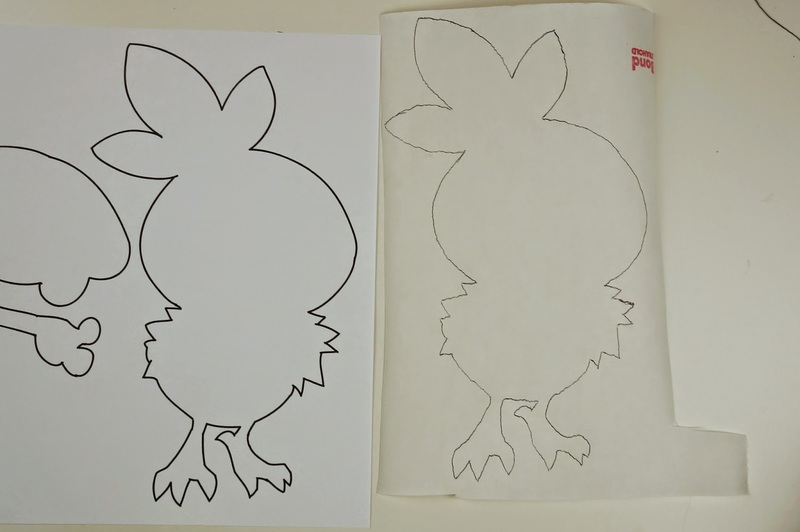 Remove paper backing from each pokemon and place on right side of black circle using the placement guide above for reference. 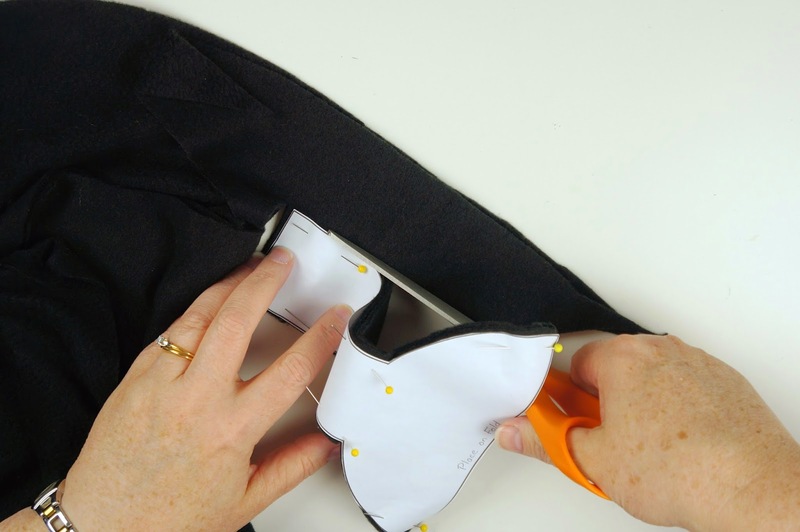 Make sure to leave seam allowance around edge. 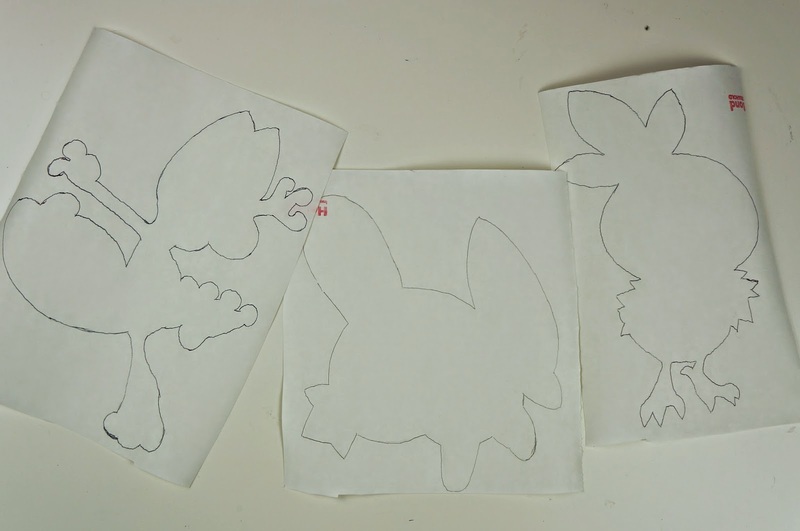 Following manufacturers directions, iron pokemon in place. 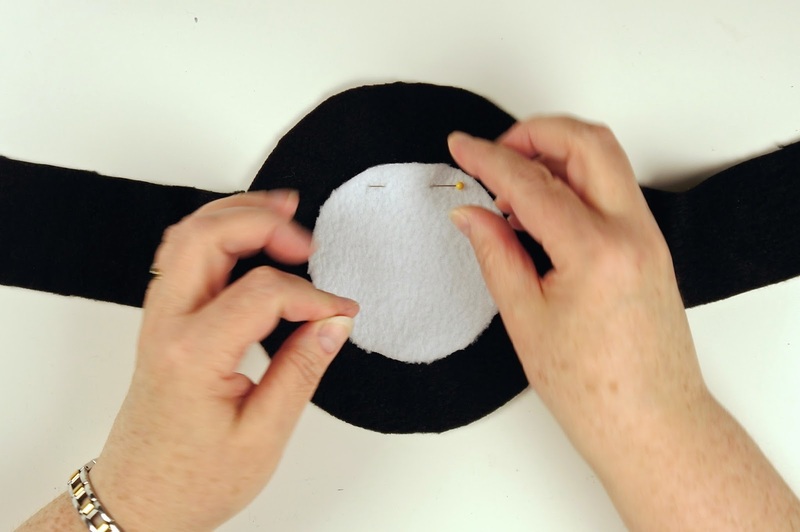 With right sides together, line up the tops of the circles and pin together. 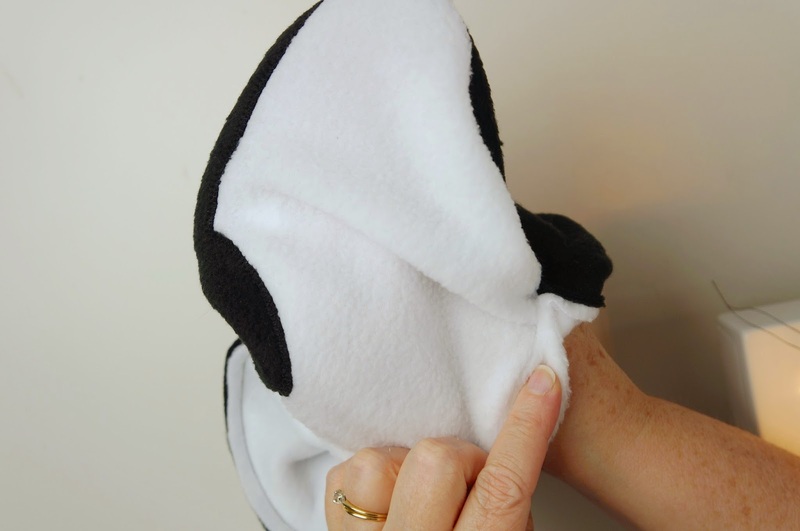 Leave a hand width opening at bottom of pillow for turning and stuffing. 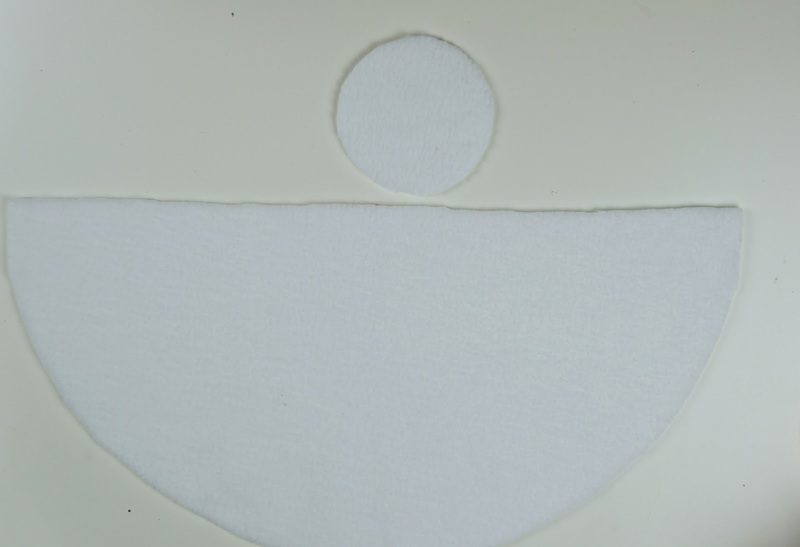 Sew pressure foot width around circle, remember to leave an opening. 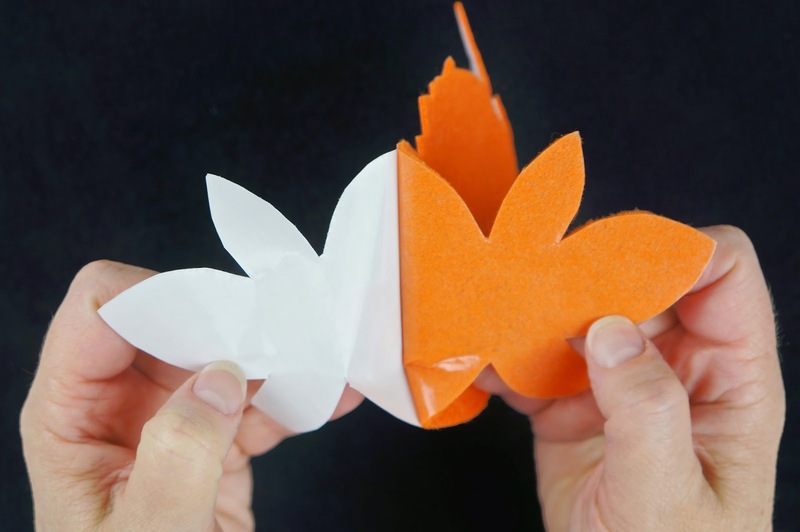 Turn right sides out through opening. Stuff pillow to desired firmness. 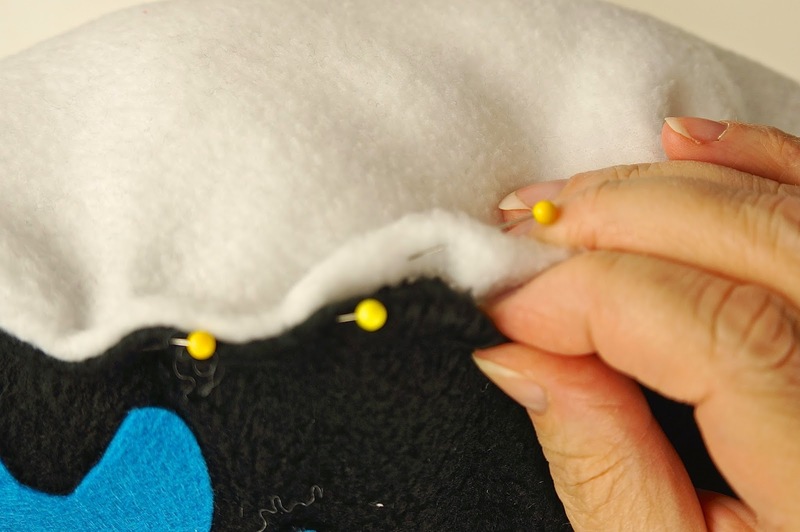 We recommend pulling apart the stuffing before filling pillow to remove clumps. 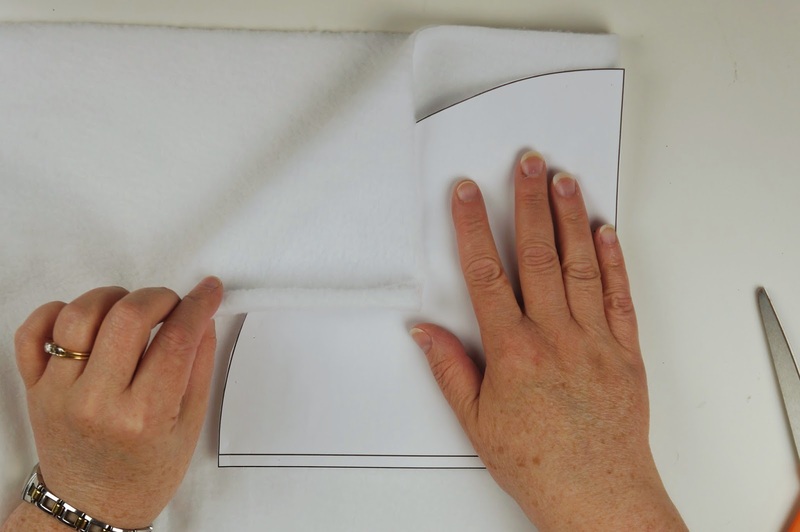 At opening in bottom, fold raw edges inward, pin sides together and hand sew using ladder stitch. 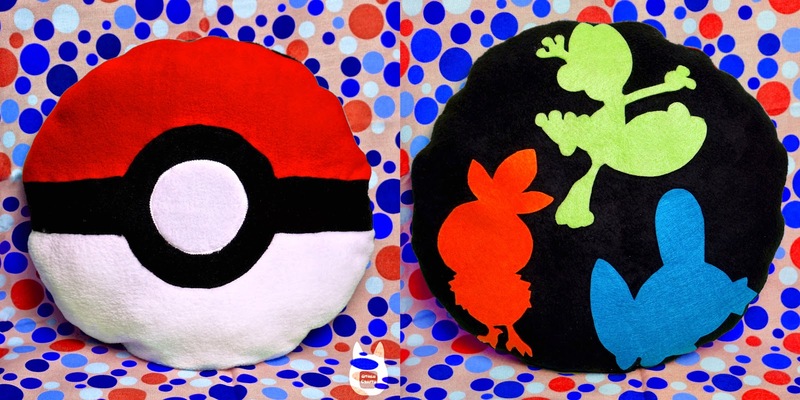 Now you have your finished Pokemon Pillow! This is so cool! 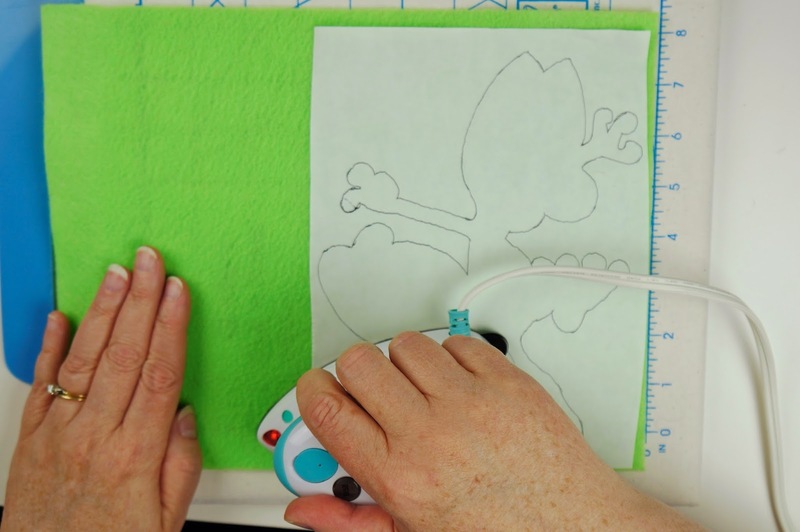 Where can you get iron on transfer paper? Can you get it from spotlight or lincraft? 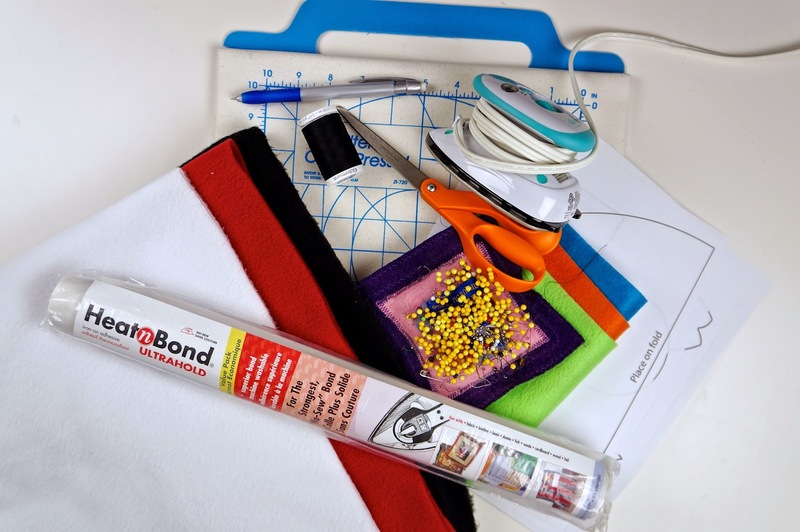 Heat n Bond can be found most places that sewing supplies are sold. It can also be ordered online. 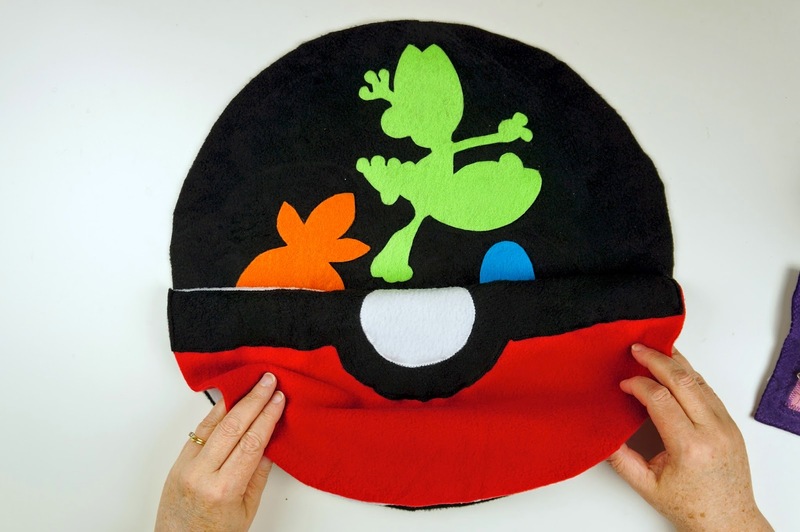 Could I just cut the Pokemon shapes out of the felt and sew them on? 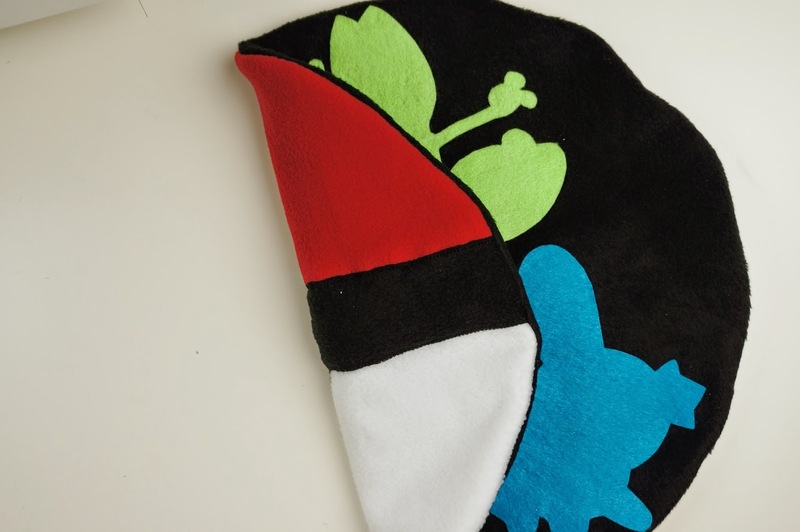 (It's awesome btw) I have all the colours and I am going to make it soon! Absolutely! 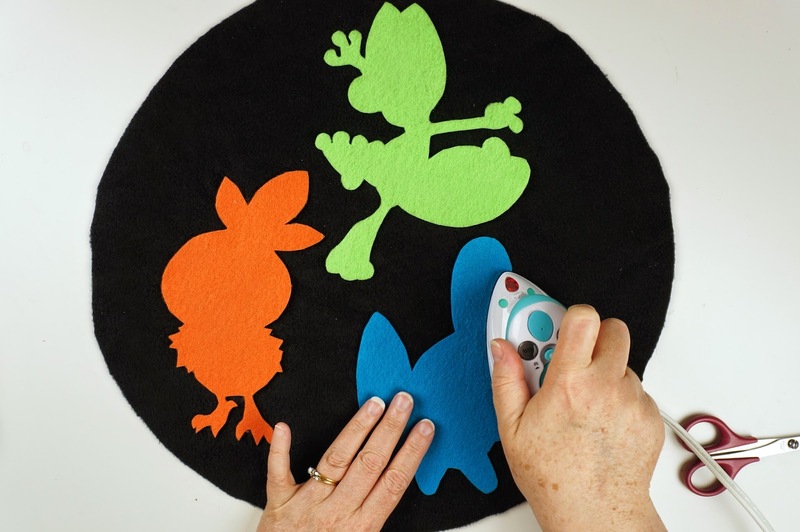 We just wanted to show how you could easily put on the shapes with Heat n Bond for those who might not have wanted to sew them on.